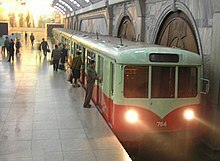 Pyŏngyang (평양 직할시 in hangul, 平壤直轄市 in hanja) is the capital and biggest city in the Democratic People's Republic of Korea or DPRK (North Korea). The government does not want people to know anything so Pyongyang is one of the few places in North Korea that foreigners (people from other countries) can travel to. Pyongyang is a closed city meaning that North Koreans can't just go there. They must apply for a permit or be high up in the military. It is the most advanced city in the country which allows tourists to go there. Pyongyang does not really show what North Korea is really like as the government uses it to give the illusion to tourists that the country is not poor. The city is kept very clean and littering is strictly not allowed. The city is home to the DPRK's only fast food restaurant which only the most privileged North Koreans go to (a meal would be worth around a weeks wages for the average person there). Many shops there have plastic food on display in the windows to make tourists think that there is lots of food in the country when in fact, food is scarce. The city has lots of nice attractions like the statues of Kim Il-Sung and Kim Jong-Il at Mansudae hill. The Juche tower is one of the most recognisable landmarks in the country, towering over the Taedong River across from Kim Il-Sung square. It also has the world's deepest subway system. Pyongyang has many large parks and wide avenues as well as the largest sports stadium in the world, the Rungrado May Day Stadium. The city is also the location of the embalmed bodies of the two leaders, Il-Sung and Jong-Il in the Kumsusan Palace of the sun. Pyongyang is home to the 105-storey hotel, Ryugyong Hotel. Construction started in 1987 and the exterior was completed twenty-four years later in 2011. It was originally intended as a propaganda device to make North Korea look wealthy when a South Korean recently built the world's then-tallest building. The hotel to this day remains empty and unopened. It is a scary monument to the government's problems. The population of Pyongyang is 3,255,388. This page was last changed on 22 August 2018, at 04:12.